Communication senior Chelsea Taylor shows off her costume designs, which she said are a departure from those in the Audrey Hepburn movie. As the Dolphin Show gears up for the premiere of its production of “My Fair Lady,” the director and actors are adding their finishing touches on their “re-envisioned” rendition of the classic musical. Meanwhile, behind the scenes, costume designer Chelsea Taylor is preparing for her first-ever costume parade, when she’ll see her fellow actors wearing the final products of weeks of hard work. The Communication senior about her inspiration and what the audience should expect as they attend the 71st annual Dolphin Show. The Current: This rendition of “My Fair Lady” is described as a “re-envisioned” and “modern” version. I imagine a large part of this will depend on the costumes. How have you tried to incorporate this into your designs? Chelsea Taylor: I wouldn’t say that it’s “modern,” necessarily, but it’s more that the director, Tristan (Powell), said that I could have freedom on the period, so it’s not strictly set in 1912. There’s aspects from the ’60s. There’s some from the 1800s. There’s just a whole spectrum of periods, but it is all set in the same kind of world where we’re pushing certain images to reflect Eliza’s transition from being this poor flower girl into an independent woman. The Current: Do you think the audience will be surprised at the direction you took for this production? CT: Yes, I hope so! For people who have seen the movie — we’re not doing the movie at all. We’re doing our own completely new thing. I know that at the horse racing scene, everyone knows the black and white costumes from the movie, but ours is full of flowers. It’s full of colors. It’s very different. I hope that there are little surprises everywhere for people to come and see. The Current: Whose costume do you like the most in the production? CT: That’s so hard. We got this fantastic girl named Sarah Wachtel, and she’s creating some original costume pieces for the show. Lillie Cummings is playing Eliza, and Sarah has made, completely from scratch, two fantastic dresses for her. One is during the horse racing scene; it’s a gorgeous color and makes her pop out from everyone else in the scene. The second dress is for this big ball that she goes to. It’s a really, really pretty color, too. It’s just so cool that she is able to take an image that I just drew and came up with and turn it into an actual thing. The Current: Where did you draw most of your inspiration from? CT: We gathered so many images to look at. Things from Vogue, things from historical photographs, things from ’90s grunge. We looked at movies like “Heathers.” We have gotten inspiration from everywhere. The director has this thing, where when he doesn’t quite know why he likes something, he just says, “That’s so fair!” and we know that that means it’s right for the show. 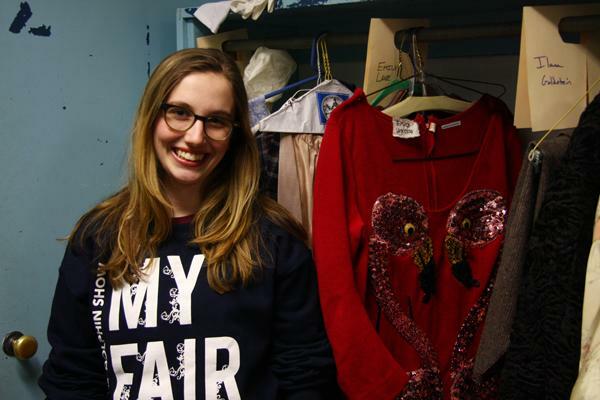 The Current: Would you see Northwestern students wearing things that appear in the show? CT: Yeah. I definitely saw things that I would wear in the show. I think that people seeing the show will be really inspired to incorporate things into their own wardrobe, hopefully. That’s one of my goals.